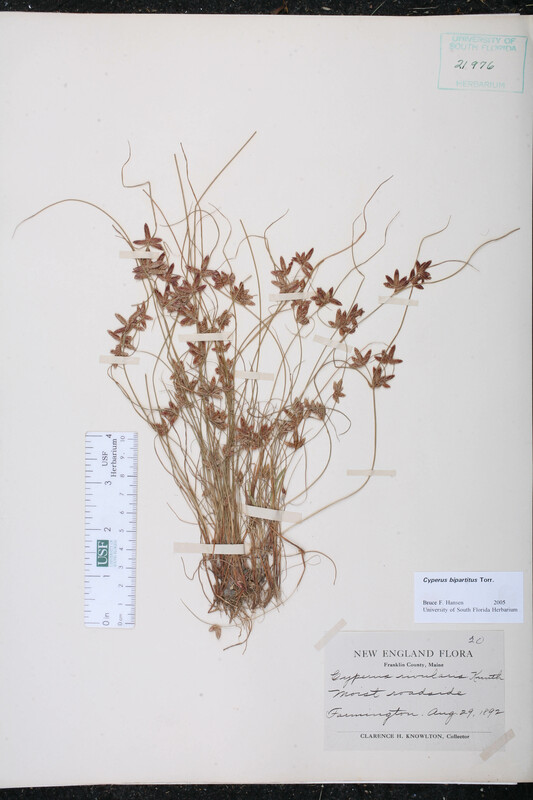 Citation CYPERUS BIPARTITUS Torrey, Ann. Lyceum Nat. Hist. New York 3: 257. 1836. Type: LOUISIANA: Orleans Par. : New Orleans, s.d., Ingalls s.n. 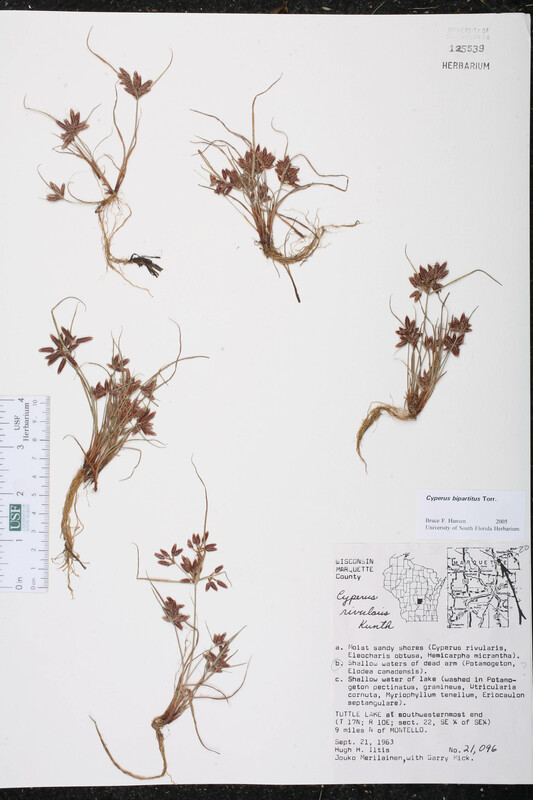 (holotype: NY). Chlorocyperus rivularis Chlorocyperus rivularis (Kunth) Rikli, Jahrb. Wiss. Bot. 27: 564. 1895. BASIONYM: Cyperus rivularis Kunth 1837. Cyperus diandrus var. bipartitus Cyperus diandrus Torrey, var. bipartitus (Torrey) Kükenthal, in Engler, Pflanzenr. 4(Heft 101): 384. 1936. 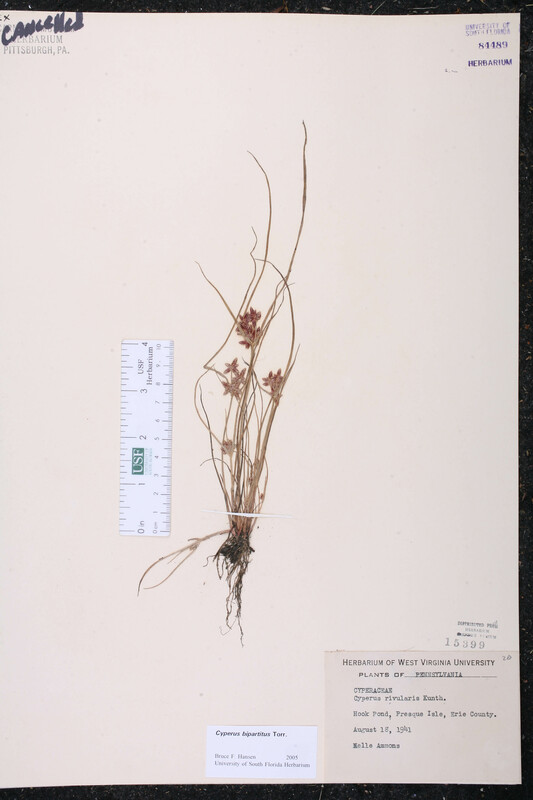 BASIONYM: Cyperus bipartitus Torrey 1836. 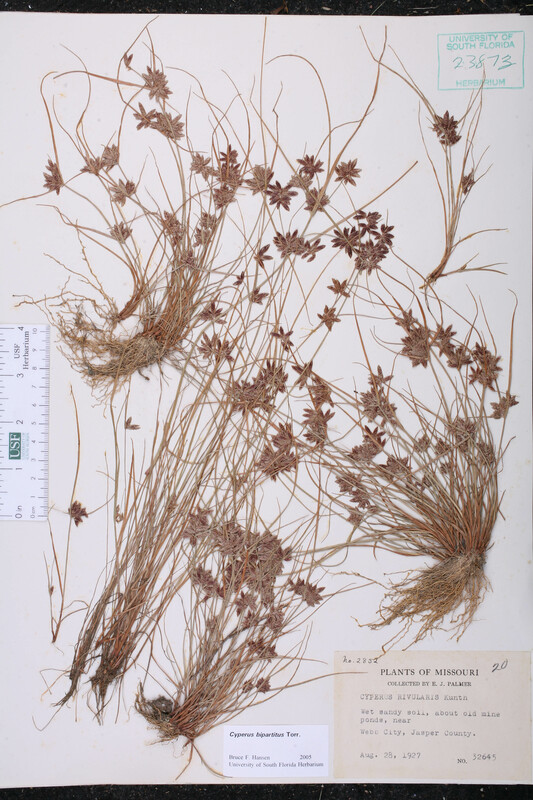 Cyperus niger var. rivularis Cyperus niger Ruiz Lopez & Pavon, var. rivularis (Kunth) V. E. Grant, Aliso 4(1): 87. 1958. BASIONYM: Cyperus rivularis Kunth 1837. Pycreus bipartitus Pycreus bipartitus (Torrey) C. B. Clarke, Bull. Misc. Inform., Addit. Ser. 8: 2. 1908. 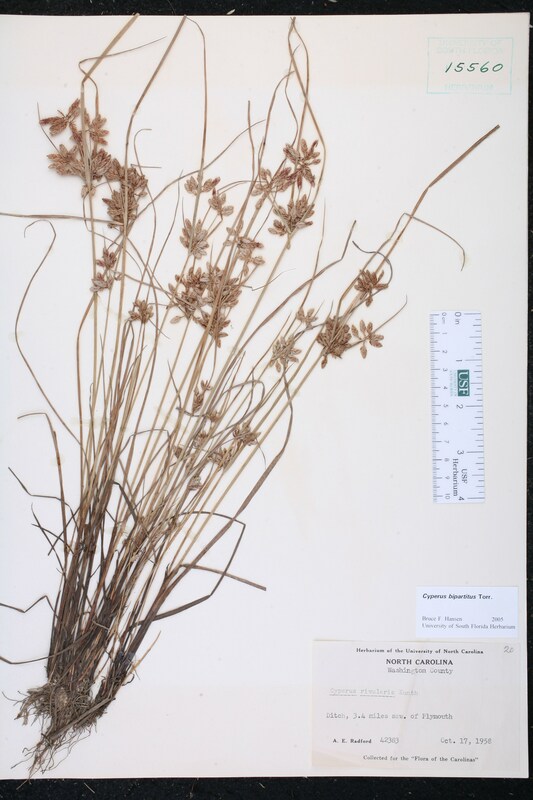 BASIONYM: Cyperus bipartitus Torrey 1836. Pycreus rivularis Pycreus rivularis (Kunth) Palla, Allg. Bot. Z. Syst. 13: 48. 1907. BASIONYM: Cyperus rivularis Kunth 1837. 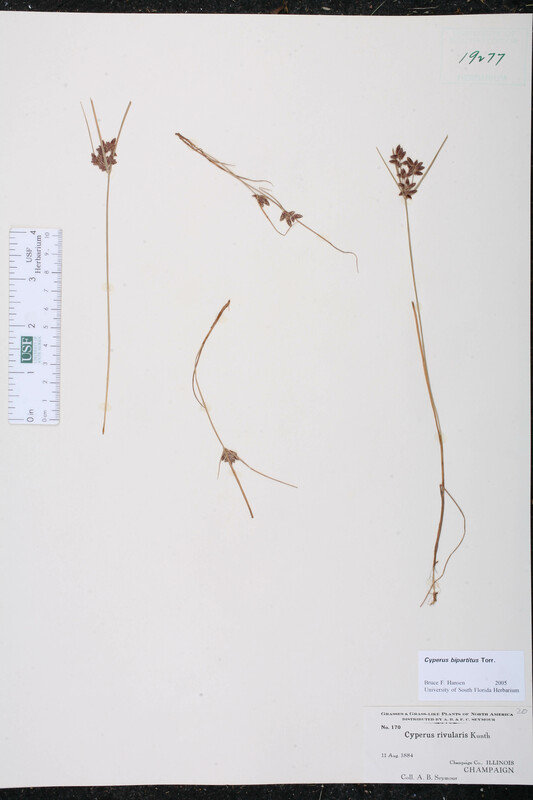 Cyperus argentinus Cyperus argentinus C. B. Clarke, J. Linn. Soc., Bot. 21: 64. 1884 ("1886"), non Boeckeler 1884. TYPE: ARGENTINA: Without data, Lorentz 1075 (holotype: K). Cyperus bigelowii Cyperus bigelowii Steudel, Syn. Pl. Glumac. 2: 5. 1855. 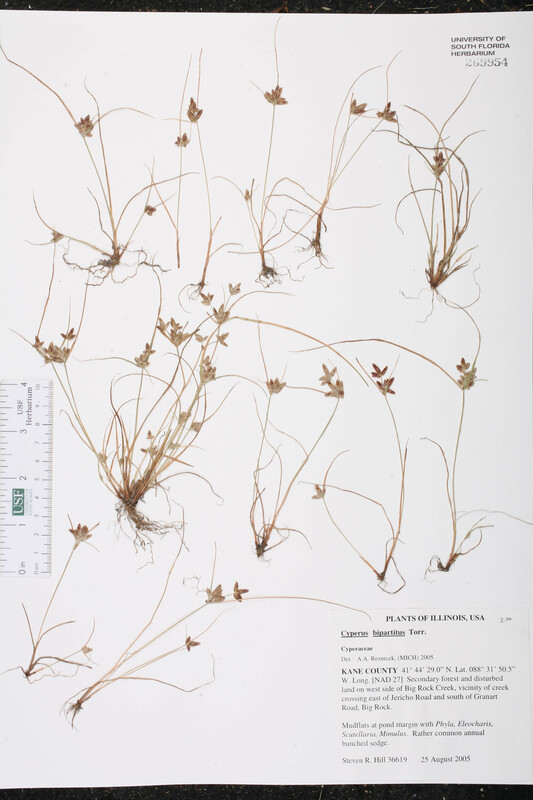 BASIONYM: Cyperus castaneus (Pursh) Bigelow 1824, non Willdenow 1797; Cyperus flavescens Linnaeus, var. castaneus Pursh 1814. Cyperus bipartitus forma elongatus Cyperus bipartitus Torrey, forma elongatus (Boeckeler) Mohlenbrock, Ill. Fl. 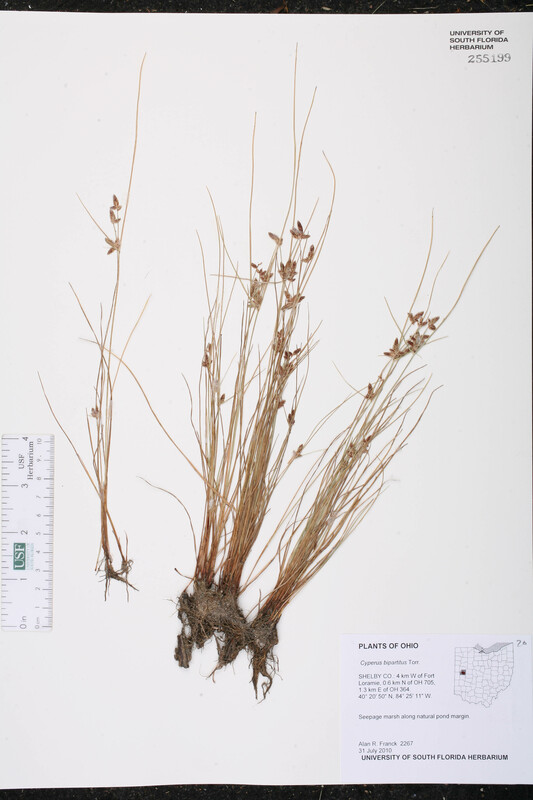 Illinois, Sedges: Cyperus to Scleria, ed. 2. 184. 2001. 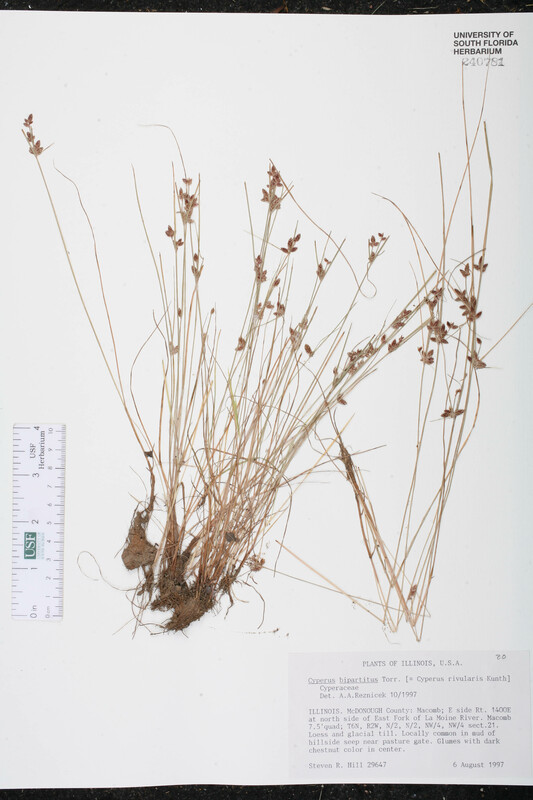 BASIONYM: Cyperus rivularis Linnaeus, var. elongatus Boeckeler 1868. Cyperus bipartitus forma elutus Cyperus bipartitus Torrey, forma elutus (C. B. Clarke) Mohlenbrock, Ill. Fl. 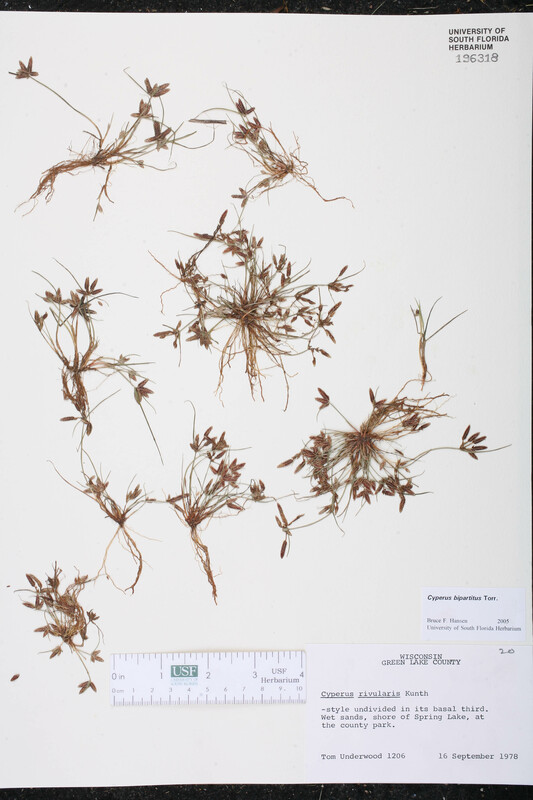 Illinois, Sedges: Cyperus to Scleria, ed. 2. 184. 2001. BASIONYM: Cyperus rivularis Kunth, var. elutus C. B. Clarke 1884. Cyperus castaneus Cyperus castaneus (Pursh) Bigelow, Fl. Boston, ed. 2. 18. 1824, non Willdenow 1797. 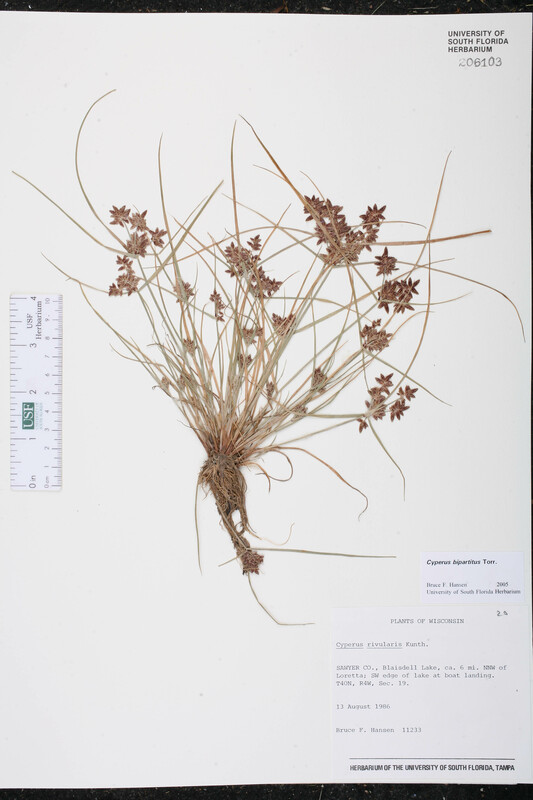 BASIONYM: Cyperus flavescens Linnaeus, var. castaneus Pursh 1814. 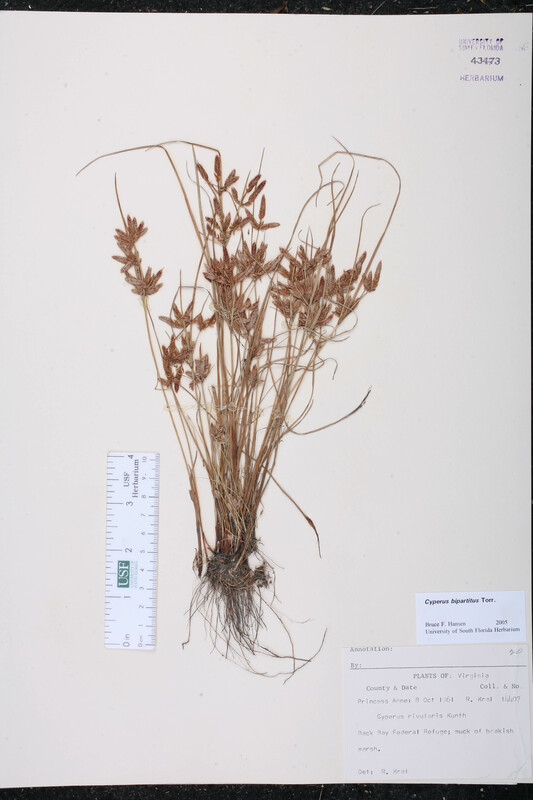 Cyperus diandrus var. 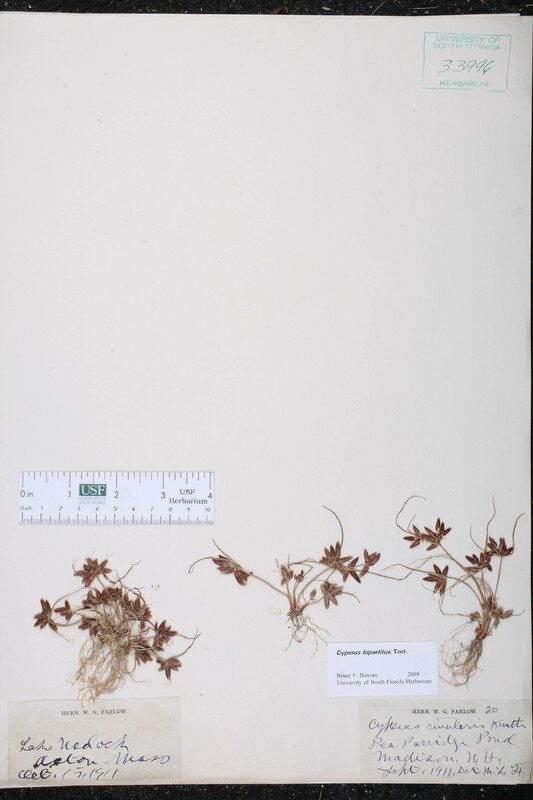 castaneus Cyperus diandrus Torrey, var. castaneus (Pursh) Torrey, Ann. Lyceum nat. Hist. New York 3: 252. 1836. 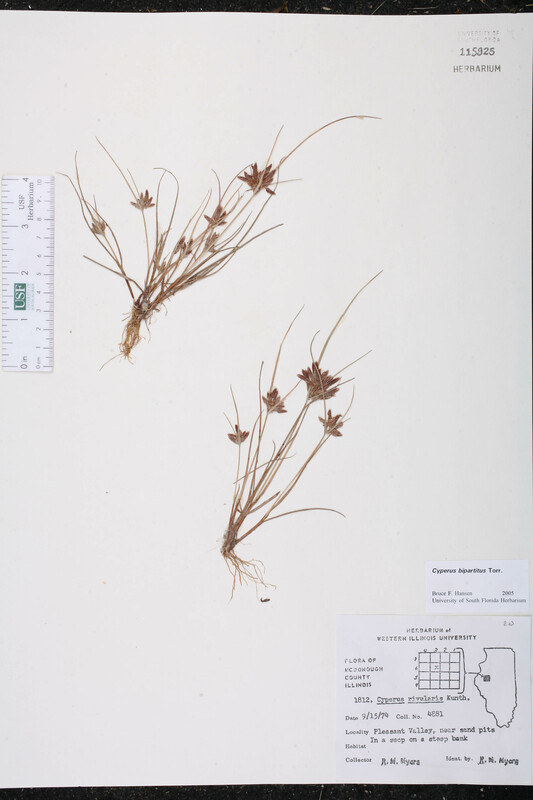 BASIONYM: Cyperus flavescens Linnaeus, var. castaneus Pursh 1814. Cyperus flavescens var. bicolor Cyperus flavescens Linnaeus, var. bicolor Farwell, Amer. Midl. Naturalist 12: 118. 1930. 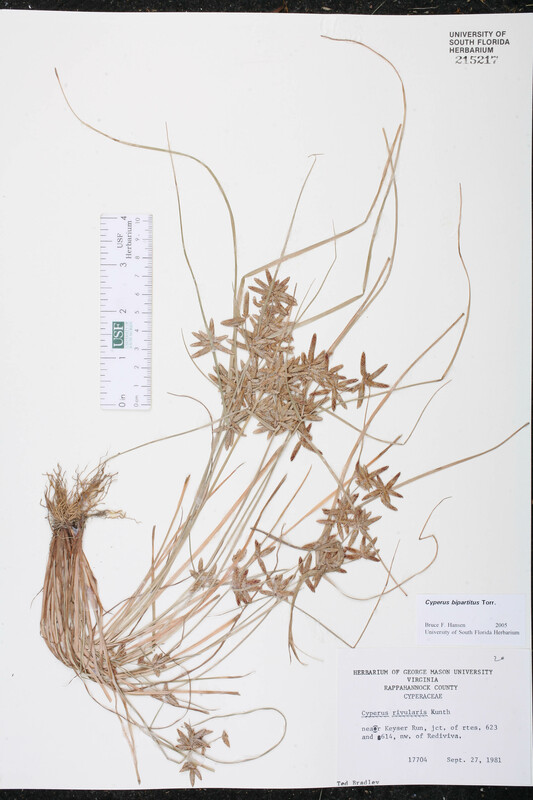 BASIONYM: Cyperus bicolor Barton 1818, non Vahl 1805. Cyperus flavescens var. 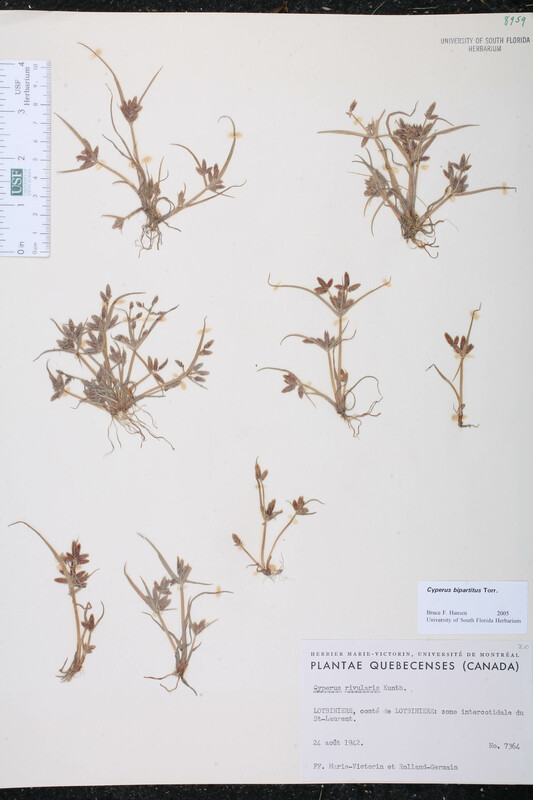 castaneus Cyperus flavescens Linnaeus, var. 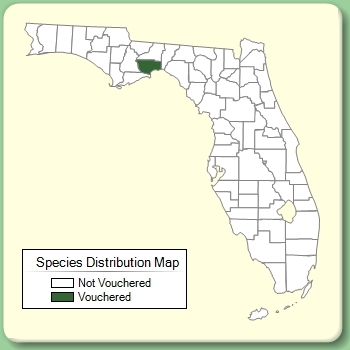 castaneus Pursh, Fl. Amer. Sept. 52. 1814. 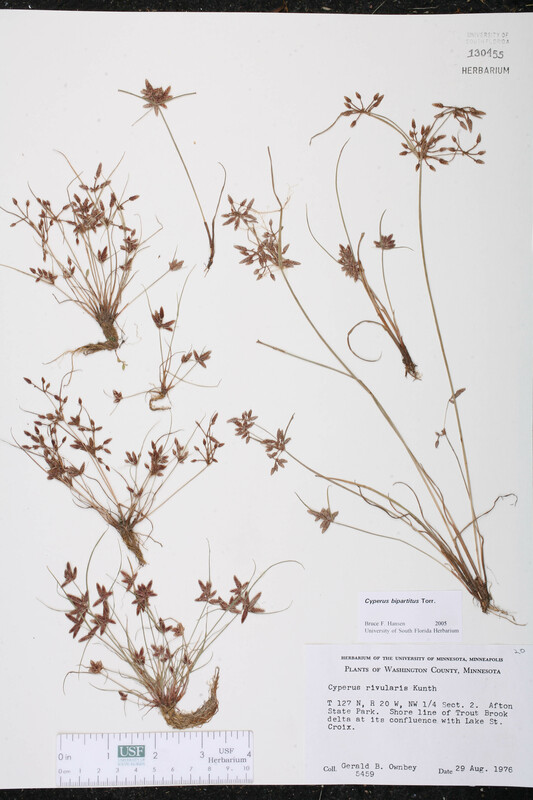 Cyperus lagunetto Cyperus lagunetto Stuedel, Syn. Pl. Glumac. 2: 5. 1854. TYPE: VENEZUELA: Mérida: Bailadores, Jun 1843, Linden 1896 (holotype: ? ; isotype: BR). Cyperus rivularis forma acutatus Cyperus rivularis Kunth, forma. acutatus (C. B. Clarke) Kükenthal, in Engler, Pflanzenr. 4(Heft 101): 383. 1936. BASIONYM: Cyperus rivularis Kunth, var. acutatus C. B. Clarke 1884. Cyperus rivularis forma depauperatus Cyperus rivularis Kunth, forma depauperatus (C. B. Clarke) Kükenthal, in Engler, Pflanzenr. 4(Heft 101): 383. 1936. BASIONYM: Cyperus rivularis Kunth, var. depauperatus C. B. Clarke 1884. Cyperus rivularis forma elongatus Cyperus rivularis Kunth, forma elongatus (Boeckeler) Kükenthal, in Engler, Pflanzenr. 4(Heft 101): 383. 1936. 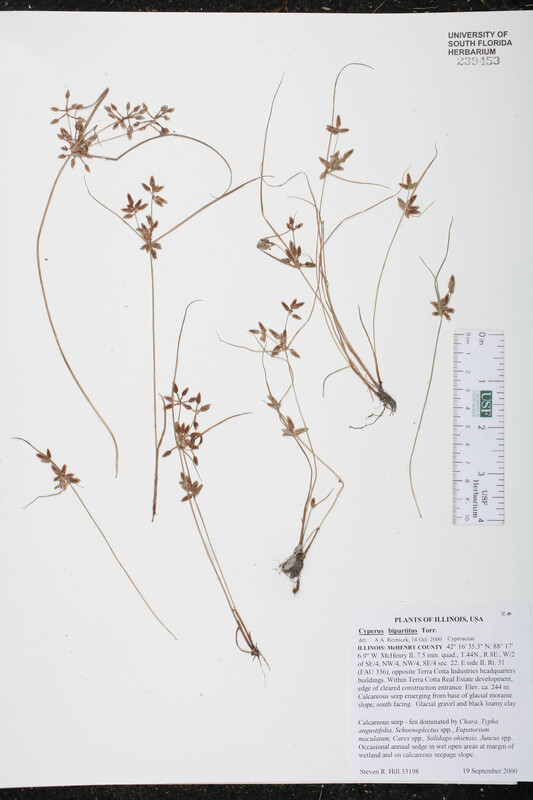 BASIONYM: Cyperus rivularis Linnaeus, var. elongatus Boeckeler 1868. Cyperus rivularis forma elutus Cyperus rivularis Kunth, forma elutus (C. B. Clarke) Kükenthal, in Engler, Pflanzenr. 4(Heft 101): 383. 1936. BASIONYM: Cyperus rivularis Kunth, var. elutus C. B. Clarke 1884. Cyperus rivularis subsp. lagunetto Cyperus rivularis Kunth, subsp. lagunetto (Steudel) Kükenthal, in Engler, Pflanzenr. 4(Heft 101): 383. 1936. BASIONYM: Cyperus lagunetto Steudel 1854. Cyperus rivularis var. elongatus Cyperus rivularis Kunth, var. elongatus Boeckeler, Linnaea 35: 453. 1868. Cyperus rivularis var. lagunetto Cyperus rivularis Kunth, var. lagunetto (Steudel) O'Neill, Rhodora 44: 86. 1942. BASIONYM: Cyperus lagunetto Steudel 1854. Pycreus lagunetto Pycreus lagunetto (Steudel) C. B. Clarke, Bot. Jahrb. Syst. 30(Beibl. 68): 8. 1901. BASIONYM: Cyperus lagunetto Steudel 1854. USA New Hampshire Madison Co. Sep 1911 W. G. Farlow s.n. USA Maine Franklin Co. 29 Aug 1892 C. H. Knowlton s.n. USA Pennsylvania Erie Co. 18 Aug 1941 N. P. Ammons s.n.